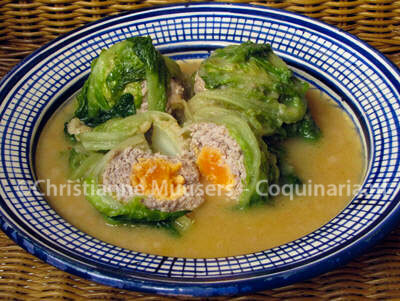 The original recipe on this page is called Om Frickedillen in Krop-salaet te maken (to make frickedillen in lettuce). According to Dutch dictionaries, a ‘ frikadel’ is obsolete for meatball, and ‘frikandel’ is vernacular and incorrect. The Frickedillen from the recipe below are indeed meatballs, prepared with minced veal. But my dictionaries are wrong about the frikandel, which has a particular meaning since the fifties of the last century: it is a typically Dutch snackfood. It’s an arrow-straight and thin sausage without skin, made from unrecognizable meat that is pressed through a funnel. I once asked in a snackbar if the man sold frikadels. “No lady, don’t sell’em.” He did sell frikandels, with an ‘n’. He also had'”hot balls”, but that those meatballs were once called frikadel, was new to him. You can buy a frikandel in any Dutch snackbar (Dutch streetfood or fastfood). The sausage is deep-fried and served with mayonnaise, tomato-ketchup and chopped raw onions. The meat used for the Dutch frikadel seems to be a bit of a mystery. Some maintain it was originally cow’s udder and pig snout. These used to be delicacies, but nowadays in the Netherlands you find them only hidden anway in (maybe) the Dutch frikadel and in tins of cat- or dogfood. This is a pity, because in reality udder and snout are quite tasty. I once prepared a demi-salé pig snout a friend had brought for me out of France: delicious! So there is nothing wrong with these meats being used for sausage. Be real, do you think industrially prepared foodstuff uses the prime cuts of meat? 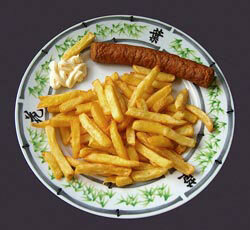 As you have read above, the modern frikandel is a long, thin, deepfried sausage. The concept was ‘invented’ in 1954 by butcher’s assistant Gerrit de Vries. A few years later (1959) Jan Bekkers from Deurne adapted the recipe for the sausage and voilà, the fastfood frikadel was born! (the frikadel on Wikipedia). In modern Dutch cookbooks you won’t find any recipes for frikandel, and the industry is rather vague on the recipe. Does it really contain offal? We are assured by the companies that make them that that is not the case. Rather, mechanically separated meat from chickens and turkeys is being used. As if that is any better than cow’s udder and pig snout! Believe me, if you can’t recognize the structure of the meat, you probably do not want to know where it comes from. In older cookbooks you can find recipes for frikadellen, but these are for Indonesian meatloaf or meatballs, or even little pancakes with whole corn/maize kernels, also called pergedel djagoeng (very tasty). In the cookbook of ‘De Amsterdamse huishoudschool’ (The Amsterdam school of housecraft) by C.J. Wannée there is a recipe for Indonesian frikadel with crabmeat and lobster. Not a cheap snack at all! (my copy is the 18th edition of Wannée’s book, 1977). The recipes for frikadellen in the seventeenth and eighteenth century, they were called frickedillen in those days, are more like modern meatballs. They are all with veal, like in the recipe below from de Dutch cookbook De verstandige kock (The Sensible Cook, see below). The Verstandige kock has several recipes for frickedillen. In the original version from 1667 there are three recipes, later editions have four. The first frickedil is a simple meatball, the recipe is titled ‘Om Frickedillen te maken’ (to make meatballs). The meatball is made with veal, mace, nutmeg and salt, and optionally some lemon or orange peel. No egg or breadcrumbs. Another recipe (‘Om Frickedillen noch andere te maken’ – Another way to make meatballs) bears some resemblance to the modern frikadel. No citrus peel, and the chopped meat is formed around “een stucxken Speck langhwerpigh gesneden” (a piece of bacon cut as a long strip) with parsley. So here we have an oblong meatball! The third recipe is absent from the first edition. The title ‘Om Frickedillen te maken sonder net’ (to make meatballs without caul) indicates that usually meatballs were wrapped in a caul to keep the meat together. In this recipe the meatball is composed the modern way, with egg and eggyolks, and breadcrumbs, pepper, mace and nutmeg. But the preparation is different: an oblong ball is formed, this is first cooked, covered in eggwhites, and then fried in butter. Going back further still, to the first Dutch collections of culinary recipes in the fifteenth and sixteenth century, there is but one recipe for frikadel, which is called a fricotel. This fricotel is very different from its successors. It is made with veal, but not with minced meat. Calf’s liver is cut into thin strips. 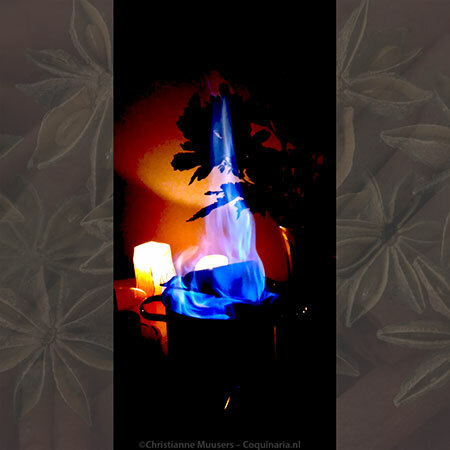 After being spiced with herbs and spices, these strips are wound around a skewer and roasted before an open fire (the source is a manuscript in the Royal Academy in Gent, ms KANTL Gent 15, vol.3, recipe 233, edited by W.L. Braekman in 1986, see also my online edition of this manuscript). After roasting, the fricotellen were simmered in a sauce with wine and vinegar. To serve, they were cut in slices, and presented with slices of bacon between the slices of fricotel. Thus endeth the short history of the frikadel in reverse. 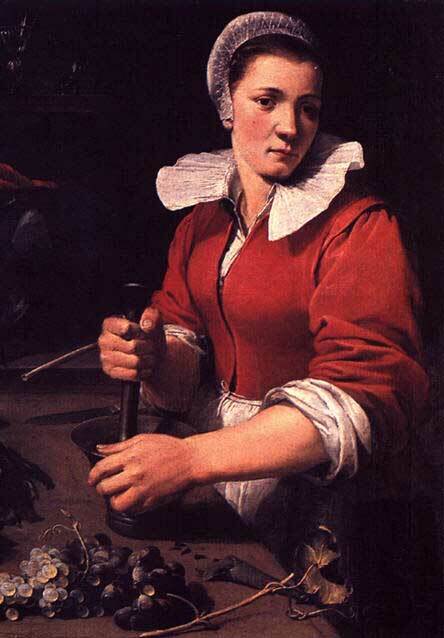 In France the first ‘modern’ cookbook appeared in 1651 (La Varenne, Le cuisinier François). In the Netherlands the only known printed seventeenth-century cookbook is a little cookbook called De verstandige kock (The Sensible Cook) that appeared as addition to the third edition of De verstandige Hovenier (The Sensible Gardener) from 1667. The little cookbook was followed by De verstandige confituurmaker (The Sensible Confectioner), and in 1668 there’s a third part, De Hollandtse Slacht-tydt (The Dutch Butchering Time). Again they were not available as cookbook, but as an addition to Het Vermakelyck Landt-Leven (The Enjoyable Country Life). This was meant for rich patricians from Amsterdam who wanted to keep a country estate. These estates had beautifully designed gardens, but also extensive kitchen gardens in which flowers, vegetables and fruit were grown for use in the kitchen and to decorate the house. The first part of Het Vermakelyck Landt-Leven learns how to plan the country estates. The second part is on the maintenance of the gardens, and the third part learns how to use the produce from the estate. Apart from the three culinary texts, this part also contains a text on making medicine and perfume, and another on keeping bees. 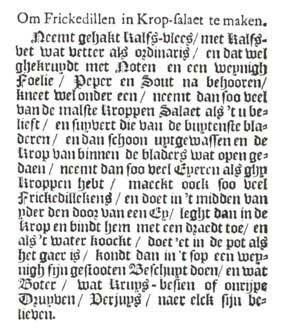 Until 1802 De verstandige kock appeared seven times as independent text, together with De Hollandtse Slacht-tydt en De verstandige Confituurmaker. (source: the introduction to the facsimile-edition of the edition of 1670, Joop Witteveen, 1993). In 2006 Marleen Willebrands published a translation in modern Dutch, based on the 1669 edition. The original text can be found on her website. Even though De verstandige kock is a ‘modern’ cookbook, the recipe below still shows some medieval traits: de sauce is thickened with bread crumbs, and is brought to taste with a tangy liquid. More information on De verstandige kock can be found at the recipe for Garden Salad. And even more recipes from this cookbook: Chicken with spring vegetables en Plum Pie. The original text: De verstandige kock, of sorghvuldige huys houdster (anonymous) from 1667, online here. For the translation I have looked at the translation by Peter G. Rose: The sensible cook. Dutch foodways in the old and the new world (a translation from a 1683 edition) Syracuse University Press, 1998. However, I have not copied her translation literally, but made some changes in interpunction and grammar to create shorter sentences, wich will facilitate reading. To make meatballs in head-lettuce. Take chopped veal with veal-fat a little fatter than usual. Spice it with nutmeg and a little mace, pepper and salt as appropiate. Knead it together. Then take as many of the tender heads as you please, and clean off the outer leaves. [And] then wash it clean, and open up the inner leaves of the head. Take then as many eggs as you have heads. Make also as many little meatballs, and place in the middle of each [meatball] the yolk of an egg. Put [the meatball] inside the head,and tie with a string. And when the water boils put them in the pot. When it is done you could add to the broth a little finely crushed rusk and some butter, some gooseberries or unripe grapes or verjuice, according to everyone’s liking. The lettuce heads should not be too small (so no ‘little gem’), because the meatballs will be rather large with the whole egg yolk inside. As you read above at the recipe for ‘meatballs without caul’, it was still not usual in the seventeenth century to add egg and breadcrumbs to meatballs. To prevent a meatball from falling apart, it was wrapped in a caul or, like in the recipe below, in something like a head of lettuce. But if you want to, just add some egg and breadcrumbs anyway. Main dish for 4 persons;preparation in advance 20 minutes; preparation 20 minutes. Wash the heads of lettuce, drain well. Remove the outer leaves. You can use these the next day for a salad (not with the meatballs, that would be too much of the same). Prepare the minced veal: knead the meat with chopped fat, spices, and the bread crumbs or crumbled rusk. Remove the yolks from the hardboiled eggs. If you want to, you can use the chopped egg whites as garnish later on. Make four meatballs, and carefully put in the middle of each ball a hardboiled yolk. Remove if necessary some of the inner leaves of the heads of lettuce. Place in the middle of each head a meatball. Bind with kitchen twine. 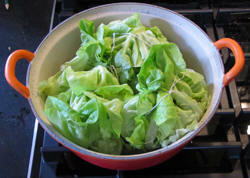 Lay the stuffed heads of lettuce side by side in a pan in which they fit snugly. Pour in some water. It should reach halfway. Bring to the boil, and let the heads simmer, covered, for seven minutes. Carefully turn them over, simmer for seven more minutes. Drain the meatballs-in-lettuce but keep them warm. Reduce the simmering-liquid by one-third. Bind the sauce with the crumbled rusk (or use toasted bread-crumbs). Bring to the boil once more. 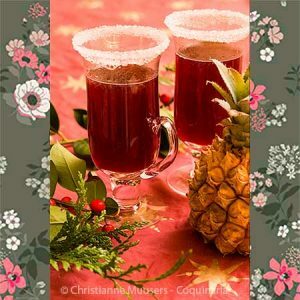 Season to taste with some sour liquid like apple-vinegar, gooseberry- or grapejuice. The sauce should taste slightly sour. Remove the kitchen twine from the heads of lettuce. Put the heads on a decorative dish. If you wish, you can cut the heads in half, to show the yellow surprise in the middle. Pour some of the sauce around the meatballs, serve the remainder in a sauce boat. This is the green juice of sour, unripe grapes that was used in the Middle Ages and up to the eighteenth century. You can still buy it, but you may have to look for it. In the Netherlands verjuice was also made from unripe apples and sorrel. You can use applecider vinegar as a substitute. Make your own Verjuice. Manuscript KANTL Gent 15: on this site there is an edition in progress of this manuscript, with translations in modern Dutch and English. W.L. Braekman, “Een belangrijke middelnederlandse bron voor Vorselmans’ Nyeuwen Coock Boeck (1560)” (An important Middle-dutch source for Vorselman’s New Cookbook’) . In: Volkskunde 87 (1986) pp. 1-24 (the first volume of KANTL Gent 15). W.L. Braekman, Een nieuw zuidnederlands kookboek uit de vijftiende eeuw. Scripta 17, Brussel, 1986 (vols two and three). De verstandige kok; an edition in modern Dutch and with introduction by Marleen Willebrands. Uitgeverij Pereboom, Bussum, 2006. The Sensible Cook: Dutch Foodways in the Old and the New World , English translation of De verstandige kok and introduction by Peter Rose (Syracuse University Press, 1998). This is the only English edition available. As to the adapted recipes, I sometimes disagree with her. For example, she never mentions the direct source of the adapted recipes, nor quotes the original text (not even in translation) if the source is other than the Sensible Cook. This makes it difficult to judge the adaptations. Just take her version of Meatballs in head lettuce: Was another version of this recipe used, or else what were her reasons to leave out mace in the meatballs and the sour liquid like grapejuice, gooseberries or verjuice to finish off the sauce and the rusk to thicken it? Moreover, she suggests serving boiled potatoes with the meatballs. In the seventeenth century bread would have accompanied this dish, potatoes only became staple food at the end of the eighteenth century. Her suggestion to insert raw egg yolks in the meatballs instead of cooked ones is interesting. Indeed the recipe doesn’t mention whether the yolks are raw or cooked. I have chosen cooked egg yolks because that’s what I know from other recipes. And how do you keep those raw yolks whole whilst packing them in meat?